The House of Medici (/ˈmɛdɨtʃi/ med-i-chee; Italian pronunciation: [de ˈmɛːditʃi]) was a banking family, political dynasty and later royal house that first began to gather prominence under Cosimo de' Medici in the Republic of Florence during the late 14th century. The family originated in the Mugello region of the Tuscan countryside, gradually rising until they were able to fund the Medici Bank. The bank was the largest in Europe during the 15th century, seeing the Medici gain political power in Florence — though officially they remained citizens rather than monarchs. The Medici Bank was one of the most prosperous and most respected institutions in Europe. 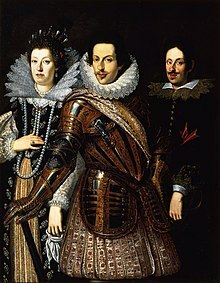 There are some estimates that the Medici family were the wealthiest family in Europe for a period of time. From this base, they acquired political power initially in Florence and later in wider Italy and Europe. A notable contribution to the profession of accounting was the improvement of thegeneral ledger system through the development of the double-entry bookkeeping system for tracking credits and debits. The Medici family were among the earliest businesses to use the system. 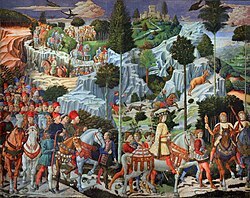 The Medici family came from the agricultural Mugello region, north of Florence, being mentioned for the first time in a document of 1230.The origin of the name is uncertain. Medici is the plural of medico, also written "del medico" or "delmedigo", meaning, "medical doctor". It has been suggested that the name derived from one Medico di Potrone, a castellan of Potrone in the late 11th century, who presumably was the family's ancestor. The Medici family was connected to most other elite families of the time through marriages of convenience, partnerships, or employment, as a result of which the Medici family had a central position in the social network: several families had systematic access to the rest of the elite families only through the Medici, perhaps similar to banking relationships. Some examples of these families include the Bardi, Salviati, Cavalcanti, and the Tornabuoni. This has been suggested as a reason for the rise of the Medici family. Members of the family rose to some prominence in the early 14th century in the wool trade, especially with France and Spain. Despite the presence of some Medici in the city's government institutions, they were still far less notable than other outstanding families such as the Albizzi or the Strozzi. One Salvestro de' Medici was speaker of the woolmakers' guild during the Ciompi revolt, and one Antonio was exiled from Florence in 1396. The involvement in another plot in 1400 caused all branches of the family to be banned from Florentine politics for twenty years, with the exception of two: from one of the latter, that of Averardo de' Medici, originated the Medici dynasty. Tuscany participated in the Wars of Castro (the last time Medicean Tuscany proper was involved in a conflict) and inflicted a defeat on the forces of Urban VIII in 1643.The war effort was costly and the treasury so empty because of it that when the Castro mercenaries were paid for, the state could no longer afford to pay interest on government bonds, with the result that the interest rate was lowered by 0.75%. At that time, the economy was so decrepit that barter trade became prevalent in rural market places. The Medici lacked male heirs, and in 1705, the grand ducal treasury was virtually bankrupt. The population of Florence declined by 50%; the population of the grand duchy as a whole declined by an estimated 40%. Cosimo desperately tried to reach a settlement with the European powers, but Tuscany’s legal status was very complicated: the area of the grand duchy formerly comprising theRepublic of Siena was technically a Spanish fief, while the territory of the old Republic of Florence was thought to be under imperialsuzerainty. Upon the death of his first son, Cosimo contemplated restoring the Florentine republic, either upon Anna Maria Luisa's death, or on his own, if he predeceased her. The restoration of the republic would entail resigning Siena to the Holy Roman Empire, but, regardless, it was vehemently endorsed by his government. Europe largely ignored Cosimo’s plan, only Great Britain and the Dutch Republic gave any credence to it, and the plan ultimately died with Cosimo III in 1723. On 4 April 1718, Great Britain, France and the Dutch Republic (and later Austria) selected Don Carlos of Spain, the elder child ofElisabeth Farnese and Philip V of Spain, as the Tuscan heir. By 1722, the Electress was not even acknowledged as heiress, and Cosimo was reduced to spectator at the conferences for Tuscany's future. On 25 October 1723, six days before his death, Grand Duke Cosimo disseminated a final proclamation commanding that Tuscany stay independent: Anna Maria Luisa would succeed uninhibited to Tuscany after Gian Gastone, and the Grand Duke reserved the right to choose his successor. However, these portions of his proclamation were completely ignored and he died a few days later. The Ruspanti, Gian Gastone's decrepit entourage, loathed the Electress, and she them. Duchess Violante, Gian Gastone's sister-in-law, tried to withdraw the Grand Duke from the Ruspanti sphere of influence by organising banquets. His conduct at the banquets was less than regal, he often vomited repeatedly into his napkin, belched, and regaled those present with socially inappropriate jokes.Following a sprained ankle in 1731, he remained confined to his bed for the rest of his life. The bed, oft smelling of faeces, was occasionally cleaned by Violante. The family of Piero de' Mediciportrayed by Sandro Botticelli in theMadonna del Magnificat. Later, in Rome, the Medici Popes continued in the family tradition of patronizing artists in Rome. Pope Leo X would chiefly commission works from Raphael. Pope Clement VII commissioned Michelangelo to paint the altar wall of the Sistine Chapel just before the pontiff's death in 1534. Eleanor of Toledo, princess of Spain and wife of Cosimo I the Great, purchased the Pitti Palace from Buonaccorso Pitti in 1550. Cosimo in turn patronized Vasari who erected the Uffizi Gallery in 1560 and founded theAccademia delle Arti del Disegno – ("Academy of the Arts of Drawing") in 1563. Marie de' Medici, widow of Henry IV of Franceand mother of Louis XIII, is the subject of a commissioned cycle of paintings known as the Marie de' Medici cycle, painted for theLuxembourg Palace by court painter Peter Paul Rubens in 1622-23. Although none of the Medici themselves were scientists, the family is well known to have been the patrons of the famous Galileo Galilei, who tutored multiple generations of Medici children, and was an important figurehead for his patron's quest for power. Galileo's patronage was eventually abandoned by Ferdinando II, when the Inquisitionaccused Galileo of heresy. However, the Medici family did afford the scientist a safe haven for many years. Galileo named the four largest moons of Jupiter after four Medici children he tutored, although the names Galileo used are not the names currently used. (Piero the Unfortunate) 9 April 1492 8 November 1494 Eldest son of Lorenzo the Magnificent. Overthrown when Charles VIII of Franceinvaded as a full republic was restored, first under the theocracy of Girolamo Savonarolaand then statesman Piero Soderini. Allesandro il Moro 24 October 1529 6 January 1537 Cousin of Cardinal Ippolito de' Medici, illegitimate son of Lorenzo II de' Medici, Duke of Urbino or Pope Clement VII. Acting signoreduring imperial Siege of Florence, made Duke in 1531. Cosimo I 6 January 1537 21 April 1574 Distant cousin of Alessandro de' Medici, Son of Giovanni dalle Bande Nere. dei Popolaniline descended from Lorenzo the Elder, Brother of Cosimo de' Medici; also great-grandson of Lorenzo the Magnificent through his mother, Maria Salviati, and his grandmother, Lucrezia de' Medici. 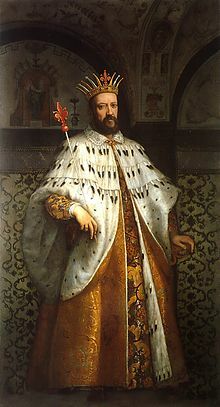 1569, h was made Grand Duke of Tuscany. Jump up^ "Medici Family - - Encyclopædia Britannica". Encyclopædia Britannica. Retrieved 27 September 2009. Jump up^ Silvia Malaguzzi, Botticelli. Artist's life, Giunti Editore, Florence (Italy) 2004, p. 33. Jump up^ The name in Italian is pronounced with the stress on the first syllable /ˈmɛ .di.tʃi/ and not on the second vowel.How to say: Medici, BBC News Magazine Monitor. In American English, MED-uh-chee. Jump up^ Padgett, John F.; Ansell, Christopher K. (May 1993). "Robust Action and the Rise of the Medici, 1400–1434". The American Journal of Sociology 98 (6): 1259–1319.doi:10.1086/230190. JSTOR 2781822.. This has led to much more analysis. Jump up^ Machiavelli, Niccolò (1906). The Florentine history written by Niccolò Machiavelli, Volume 1. p. 221..
Jump up^ Bradley, Richard (executive producer) (2003). The Medici: Godfathers of the Renaissance (Part I) (DVD). PBS Home Video. ^ Jump up to:a b The Prince Niccolò Machiavelli. A Norton Critical Edition. Translated and edited by Rober M. Adams. New York. W.W. Norton and Company, 1977. p. viii (Historical Introduction). Jump up^ 15th century Italy. Jump up^ Hibbard, pp. 177, 202, 162. Jump up^ Hibbert, The House of Medici: Its Rise and Fall, 153. ^ Jump up to:a b Hale, p. 150. Jump up^ Hale, p. 151. Jump up^ Austria and Spain were ruled by the House of Habsburg; the two are interchangeable terms for the Habsburg domains in the time period in question. Jump up^ Hale, p. 158. ^ Jump up to:a b Hale, p. 160. Jump up^ Hale, p. 165. Jump up^ Strathen, p. 368. Jump up^ Hale, p. 187. Jump up^ Acton, p. 111. ^ Jump up to:a b Acton, p. 192. Jump up^ Acton, p. 27. Jump up^ Acton, p. 38. ^ Jump up to:a b Hale, p. 180. Jump up^ Hale, p. 181. Jump up^ Acton, p. 108. Jump up^ Acton, p. 112. Jump up^ Acton, pp. 140-141. Jump up^ Acton, p. 185. Jump up^ Acton, p. 182. Jump up^ Acton, p. 243. Jump up^ Strathern, p. 392. Jump up^ Hale, p. 191. Jump up^ Acton, p. 175. Jump up^ Acton, pp. 275-276. Jump up^ Acton, p. 280. Jump up^ Acton, p. 297. Jump up^ Acton, p. 188. Jump up^ Acton, p. 301. Jump up^ Acton, p. 304. Jump up^ "Anna Maria Luisa de' Medici - Electress Palatine". Retrieved 3 September 2009. Jump up^ Acton, p. 209. Jump up^ Acton, p. 310. Jump up^ Acton, p. 309. Jump up^ Hibbert, p. 60. Jump up^ Howard Hibbard, Michelangelo (New York: Harper and Row, 1974), p. 21. Jump up^ Hibbard, p. 240.